We read three of this series, and the children love them. There seems to be a window where they really get the stories–my own kids didn’t get them at all before age 6, but couldn’t get enough of them through that year. The same has proven true with many students in Grade One . Each of the animal characters kind of embodies a particular character flaw (Peter’s troublesome curiosity, Reddy Fox’s boastfulness, Grandfather Frog’s unwillingness to take advice. etc…) that make the stories fun, and nice to refer to when these same flaws inevitably arise in our own human characters. There is a kind of old-fashioned language and morality to these books, but it is very gentle, and I think appeals to a six-year-old’s sense of justice. My only quibble with these old books is that I can’t stand the illustrations. The animals largely behave like animals in these stories, so it bugs me hugely to see them dressed up in clothes. It’s ridiculous. Luckily, it is very good for children at this age to hear stories without illustrations, as it nurtures their fundamental capacity to form mental images themselves, so I personally never share the pictures. (Just had a conversation with a Grade 5 teacher who bemoaned her students’ apparent inability to form mental images. This is another topic on its own). 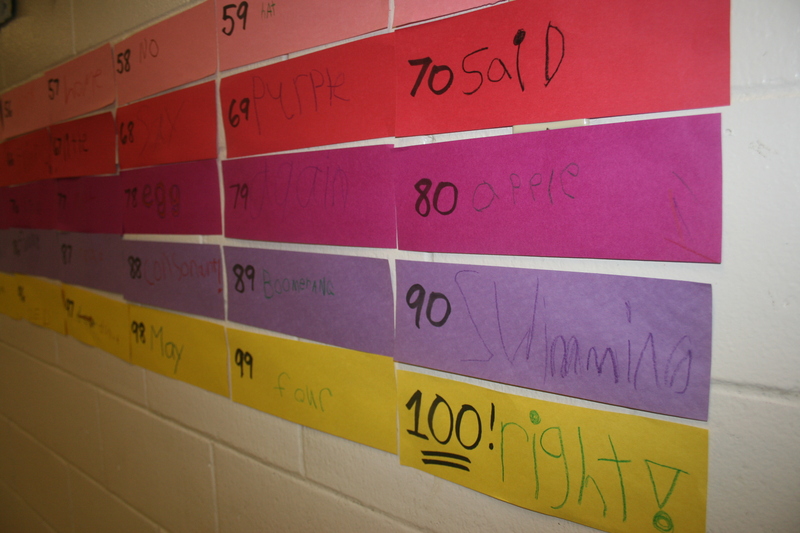 In this, my first entry in the blog experiment, I wanted to share how excited I was by my Grade One word sleuths last week. I ride through the wooded and mountain land. Defending the weak, upholding the right. I dare all adventures, my heart is so bold. For I am a gallant and glorious knight. Our initial task: simply to read through with me, and see if there were any interesting word observations or questions they could share. • Akira spotted the word <upholding>, which most had likely not encountered elsewhere, and proposed to spot a <ph> digraph. Delighted, I said, “A-ha! I wonder. And what would that <ph> be representing? Can we find the base?” There were arms madly flapping and children shouting out (though I of course shudder at such unruliness). Many of course thought <uphold> but very quickly it became clear that “there are two bases!”. (We’ve found compounds before, so this term was familiar). We agreed–as did Akira–that there was no <ph> digraph, but not without pointing out how useful it was that he had looked, as it opened the door to other discovery. • Madisyn said, “Why does <knight> start with a <k>?” I winked and said that I didn’t think it did “start with a <k>”. She was momentarily perplexed, but others were quick to proclaim the <kn> digraph. (Poor Shilo. When I asked, “Does anyone else know another word with a <kn> digraph?” and she answered, “Know”, I replied, “Oh, you don’t? 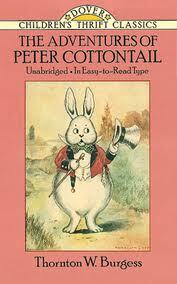 That’s too bad.” Six-year-olds eat up homophone humour–actually, who doesn’t?). Nobody had trouble spelling the word <knight> aloud, or was troubled by a six-letter word with only three phonemes. There was <light>, <right> and <fight>, as normal as could be. 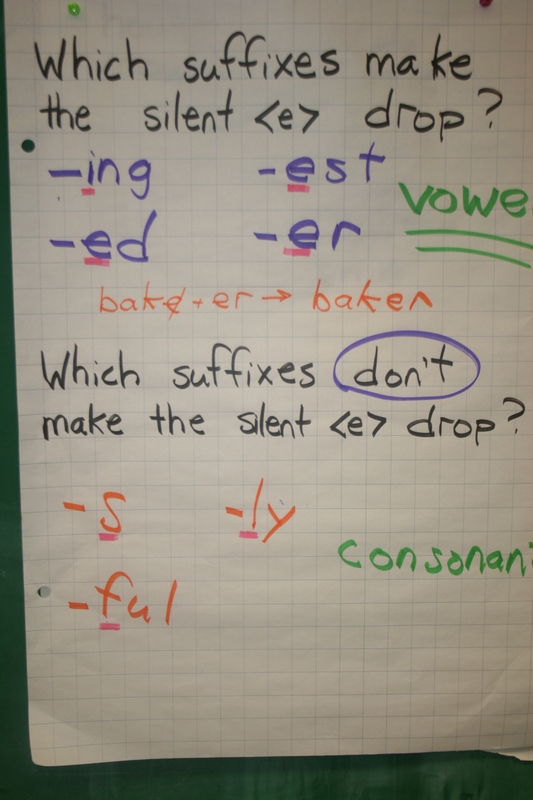 • <shining> gave us a chance to review the previous week’s discoveries about final silent <e> and suffixing. We looked back at the word <dare> and created a little word web, including <dare + ing –> daring> and so on. • We added <battle> to our collection of words that have a silent <e> we’re not sure of. But we used the word <horse> to draw out a group of those words and bring to light the convention of avoiding the appearance of a plural. Others that we had already found include <mouse> and <house>. This will be a concept we’ll revisit and reinforce. (As an aside, the children were delighted a week or two ago when I compared our word study to dragon-tackling. Though I do not usually choose to characterize such joyful work in the negative terms of violence, nor do I wish to avoid using accurate terminology, fun is fun and metaphor and story are powerful! I was simply describing how one knightly new reader was unfazed by the appearance in front of her of a “dragon” of a word, long and fearsome to many, but unperturbing to her. Armed with a steely sword of orthography, she simply sliced off the head (prefix) and tail (suffixes) and was left with an untroubling base. She was boldly and easily able to “slay” the word and move on. “Dare all adventures”– indeed). Later in the week, we returned to the text for a homophone hunt. 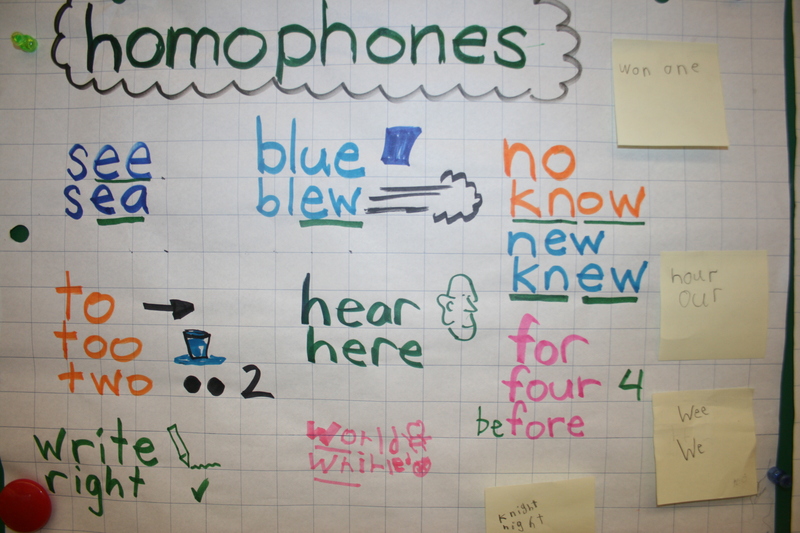 As a teaser, I said I’d found four homophones, and challenged them to find those and any more they could spot. I think we found seven. Why are homophones so important? Well, we know that they underline the centrality of meaning in the writing system, which the students appreciate greatly. Very often they identify the homophone orally before they see it in text. This is a wonderful opportunity for my “early” readers to really engage. They are just launching into independent reading, but well able to grasp the meaning in spoken language. This week, for example, Abdul eureka-ed “I have a homophone!” on more than one occasion, including the triplets for <by> and for <we>. (If you haven’t thought of the third for <we>, you haven’t lately been, as Abdul has, tobogganing). This now provides an entry for the Grade Ones to flex their knowledge of Real phonology, for instead of me immediately telling them how the homophones are spelled, I can say, “What would be a reasonable spelling?” Abdul, after a pondering pause, was quick to propose “w–double e!” and “w–ea” as the two homophones he sought. I could then point him in the direction of other choices, and lead to the comic-book convention of “Wheeeeee!”. He was unfazed by <wh>, as there are many other examples about of this quite normal digraph. All of this is meant to liberate the children from reliance upon me or anyone else in their writing, building the confidence that they have the tools to create “reasonable” spellings, and allowing them to focus on the central business of recording ideas. Correct spellings will follow. Finally, as part of our celebration of the 100th day of s chool, I couldn’t of course resist including a word component (along with baking a hundred cookies, my other passion). Together we compiled a list of 100 words. Now, you know I am no fan of random word lists but it was fun for the children to realize they knew so many words. (In fact, they of course realized, “We know way more than 100! !”) So, how to make the list meaningful in some way? 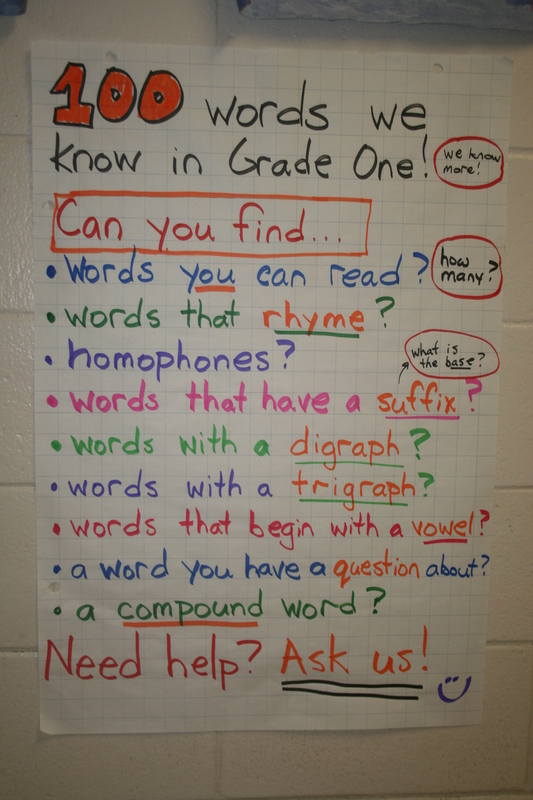 Come and see it, displayed in the hall, a word knowledge scavenger hunt challenge for the school. We’ll see if folks can find homophones, bases and suffixes, digraphs, and so on, and whether they need to take up our offer of help. Because, I advised our experts, some people may not have learned or have forgotten what some of these things are. We are now a public service provider! What better work for young knights?